“Something Is Starting to Happen”: Spain’s M15, Precursor to Occupy, Hails Probe of Ex-IMF Chief | Democracy Now! activist and filmmaker who is making a documentary about the May 15 movement in Spain. JUAN GONZÁLEZ: As news broke yesterday of the Spanish court’s investigation into Bankia’s former chief, rumors flew Rodrigo Rato and his former colleagues had been indicted. That has yet to happen. But Rato and his associates could potentially face up to six years in prison. On Thursday, Amy Goodman interviewed Stéphane Grueso, an activist and filmmaker who is making a documentary about the May 15th movement in Spain. AMY GOODMAN: This is Democracy Now!, democracynow.org, The War and Peace Report. We’re in Madrid, Spain, where a movement similar to what happened in the United States, the Occupy movement, has—well, actually began a bit before. It’s called M15, for May 15th, 2011. We’re speaking to Stéphane Grueso, who is a filmmaker who’s been documenting the M15 movement. Stéphane, if you could begin by talking about just what M15 is. STÉPHANE GRUESO: Well, M15 is the date when we went to the streets. It’s May 15th, 2011. And it’s the day we made this demonstration in the street. And the day afterwards, we started camping in Madrid and then in the whole Spain. That was a couple of months before the Occupy Wall Street, yeah. AMY GOODMAN: And what were the demands? Why did people gather? STÉPHANE GRUESO: Well, you know, we were a bunch of different peoples. We didn’t have any kind of concrete demands. We just were angry people. We didn’t like what we were seeing, you know, where we are going. We felt we are losing our democracy, we are losing our country, we’re losing our way of life. So we joined like different people with different interests. And we had one slogan, was Democracy Now Real—we want a real democracy now, you know, just like your program. And so, we joined, and we went to the streets, but we didn’t have any concrete demands and any concrete actions. It was just like joining, coming together and see what happens. And it happened, actually. STÉPHANE GRUESO: It happened that we stayed in the streets, I mean. Like 50 people stayed overnight in Puerta del Sol, this square. And then the police tried to take them out, and so we came back. And then this thing began to multiply in other cities in Spain. And, I don’t know, in three, four days’ time, we were like tens of thousands of peoples in, I don’t know, dozens of cities in Spain, like camped in the middle of the city—you know, a little bit like we’ve seen in Tahrir in Egypt. We were, like, copying what we’ve seen. AMY GOODMAN: Now, they were calling for the end of the Mubarak dictatorship. Once you had so many people, what was the demand? STÉPHANE GRUESO: Well, you know, we tried to make like a short list of demands that we all agreed. We couldn’t make it, because we were so different. But there were a couple of things that they were like—I mean, they were in the top five of our demands. And it was that we want to change our electoral law. In Spain, when you vote, they have some kind of proportional system, that the fact is that no other party than Partido Popular or Partido Socialista, the two big ones, is able to go into government. So we want to change this electoral system. We want to use another one. We want to separate the powers. You know, in the Constitution, it says that you have the three powers: legislative, executive and judicial. But we want them to be really separated. We want an independent judicial power. That doesn’t exist in Spain, this kind of thing. We want to expel the corruption from the public life. As of today, there are like, I don’t know, like a dozen of congressmen that they are implicated in corruption cases, and they are still in the parliament. I mean, we don’t want this, these kind of things. We want transparency. We don’t have a transparency law in Spain. Now we have a new one, which is not good, actually, but we didn’t have any kind of transparency law. I mean, we want to know what they are doing with our money. AMY GOODMAN: And how did the media cover the M15 movement? STÉPHANE GRUESO: Well, it was very curious, because, you know, the first big—how do you call—the first big front page of the 15M movement with a big picture, so it was the Washington Times — no, Washington Post, actually. It was the first one, you know. The newspapers here in Spain, first—first of all, they didn’t understand what happened. I mean, and it was legitimate, I mean, because it was something strange. We didn’t know what was going on, and they didn’t know. But then, they were like ignoring us. You know, it was like five days before the election in Spain, and we weren’t in the press, I mean. And then they began to inform, but they began to lie. They began to say like we were, like, violent, you know, like we were like all young, extreme left-wing guys. And that’s not the truth. So, but that’s no problem. We made our own media, you know. STÉPHANE GRUESO: How? You know, as of today, we have like a radio program here in Madrid. We have a television emission with a couple of programs. We have a newspaper that we print 45,000 copies each month. And we are, you know, like a bunch of people that come together. We are professionals. We are a lot of journalists. We are a lot of people that design, that can do things, a lot of filmmakers, as well. So, I mean, we decided to do our news, because, I mean, what we saw, it wasn’t the reality, so we decided to do by ourselves. AMY GOODMAN: And when you say that it wasn’t just a small group of progressive, left-wing people, who did it start to include more of? STÉPHANE GRUESO: You know, of course there was—I mean, all these guys, all the traditional activists, they were there. But there were a lot of new people, like myself. I mean, I don’t have a history of activism before. I mean, this 2011, before the 15M, before May, I started to do things because I was like fed up. But, I mean, there were like a lot of new people in the streets. We were new people there. We were like meeting together, recognizing. And it was very nice because, you know, we didn’t have all these things that you carry with you. When you belong to an organization or something, there are good things, but there are bad things. But we are all like new. We were like creating something new, and it was like very nice. So these guys, they took part—the traditional activists, I will say—but then they left. You know, they came here, they came with us, and then—or they left or they stayed, but they didn’t try to, you know, to—I don’t know how to say it in English. They didn’t try to, I don’t know, to come forward or to be more present like the others. So it was some kind of horizontal things, horizontal organization of new people. And it was very, very nice, and a lot of people like it. I loved it. I mean, for me, it was like a very, very good experience. AMY GOODMAN: Talk about how technology aided you in the organizing. AMY GOODMAN: And where did you get the name ”indignados”? AMY GOODMAN: So you didn’t name yourselves that? STÉPHANE GRUESO: No, I mean, we—you know, we say that this is a revolution of people. We name us the people. We are people. We are not a party. We are not a union. We are not an association. We are not indignados. We are not angry. We are people. But, I mean, they gave us a name, and this indignados is what we are known with this name. AMY GOODMAN: And so, how you organized technology? AMY GOODMAN: That was in the main plaza? STÉPHANE GRUESO: That was in the main plaza, and this account was made the very 15M, in the night, like three guys. Like, “Let’s do something. Let’s begin to spread.” You know, it was like the very first day. And we know the networks. We know how internet works. And it’s a very successful story, how we used all the technology, you know? You know, we have like our websites. We have like thousands of visits, but—hundreds of thousands, more like the newspapers. You know, we are able, as of today—if we want, tomorrow we can put in the newspapers a news. I mean, we have this power still. AMY GOODMAN: And so, how did it start that night? How many people were hitting it? STÉPHANE GRUESO: Well, there were like 40 people that stayed this very first night. And these people stayed there, and they began to say, “OK, we have to—we have to take the people—we have to tell the people to come today.” No one came. They stay these 40 people for the first night. OK. The second night, there were like 200 that slept. But then they came—it came, the police, and they took them away. But, I mean, when we realized, when we—when I read in Twitter, because I read it on Twitter, that the police took the people away, we said, “OK, this afternoon, everyone, let’s go to the square.” And we came, like, I don’t know, like 10,000 people to the square. And then we began to build our small city, you know, with all the—I remember like watching one sofa, one sofa like flying over the people in there in the square. STÉPHANE GRUESO: One sofa, you know, like a couch. AMY GOODMAN: Like a couch. AMY GOODMAN: What do you mean, a couch flying over the square? STÉPHANE GRUESO: Yeah, a big couch was like coming first day. The people like carried the couch. And then—and, you know, we built—in a couple of days, we built our city. And, you know, the police and the government, they didn’t know what to do. It was like five days before the election. They were like paralyzed. They didn’t understand. And we were absolutely nonviolent. That was another thing, because we were being—we were being provoked. But we were absolutely nonviolent. And that was difficult for them, as well. They didn’t know how to act. We were always like recording everything, like streaming everything, you know, so it was difficult for them. It’s a big success. I mean, I’m very happy. I think we did it quite good. AMY GOODMAN: So that’s May 15th, 2011. The prime minister, Socialist prime minister, Zapatero, is soon forced out. You have a right-wing government now. And where is the M15 movement? Do—you said that people are just quietly building. How? STÉPHANE GRUESO: We are everywhere, you know? The thing is that we are not—we are not in the squares. We are not, like, camped. So we are not visible. But, you know, here in Madrid, every weekend there are like—I think there are like 104 assemblies in the neighborhoods. In each one of these assemblies, there come, I don’t know, from five to 50 people. They join, and they talk. They talk about big politics, like to make the peace in the world, and about small politics—what problems do we have in our neighborhood. And that happens every week, and that’s 15M. And a lot of people is working in networks—physical networks, where we’ll meet. I mean, I have—every week, I have like three or four assemblies and reunions every week. And then over the internet, we are all like connected, here in Spain and with other countries. And we are like working. I mean, we are doing things. We didn’t stop. We are working. We are not so visible now, but we are still working, and we will go to the street again. STÉPHANE GRUESO: The evictions—this eviction thing is something really amazing. I go sometimes to try to help or—my main people here in the neighborhood. This thing, you know, they always say that “You people of the 15M, you don’t do anything. You are the whole day like in assemblies, like talking, but you don’t do anything.” OK, these things of the eviction, the fact that today in Spain everyone knows what an eviction is, and they know that there are every day like 300 evictions in the whole country, that this is a problem, this is because of us. I mean, there were people who were fighting against these evictions, but we took this thing as ours. I mean, we came with them. And now the 15M, 15M movement, is like trying to fight against these evictions. And these evictions happen when the people that lose their jobs and that cannot pay for their homes, they will get this eviction. But in Spain, it’s not like in the U.S. I mean, in Spain, you get out of your home, you lose the home, but then you have to pay the rest. So, I mean, you will have like—keep a huge debt for the rest of your life. What we are doing now is like an emergency. We are trying that they don’t get the people out of the houses. We go—50 or a hundred people, we go to the door of the house, and we try to make some civil resistance. AMY GOODMAN: In fact, Rato, who headed Bankia, it’s Bankia that’s evicting a lot of people, isn’t that right? AMY GOODMAN: You’re evicting them. STÉPHANE GRUESO: We are evicting them. I mean, we Spaniards are now the owners of these homes, and we are now evicting our own people. Come on. AMY GOODMAN: And so, what happens? What does it mean to say that Rato is indicted? STÉPHANE GRUESO: Well, you know, what happens is that, finally, finally it happens that, maybe, eventually, one of his kind maybe is going to pay. Because, you know, we citizens, we have this impression that, you know, no one of these big guys have any problem, never. They do what they want. They steal. They lie. And never happens anything. Well, now, today, maybe it’s starting to happen, something. So I’m very, very happy. 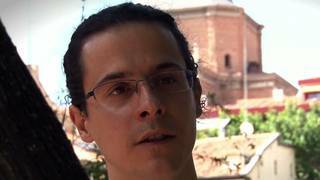 JUAN GONZÁLEZ: That was Stéphane Grueso, an activist and filmmaker in Madrid, Spain, where former bank chief Rodrigo Rato is facing a criminal investigation following the collapse of the country’s biggest mortgage lender, Bankia. We’ll be back in a minute with Glenn Greenwald.